There’s just not enough time to read everything! As such, there’s a lot of books I’ve read and loved, but I won’t ever read them again. There’s so many books on my TBR list that I can’t afford to reread everything I’ve loved. Of course there’s books that I love so much that I reread them every couple of years, but they’re things like Harry Potter and Shades of Magic. 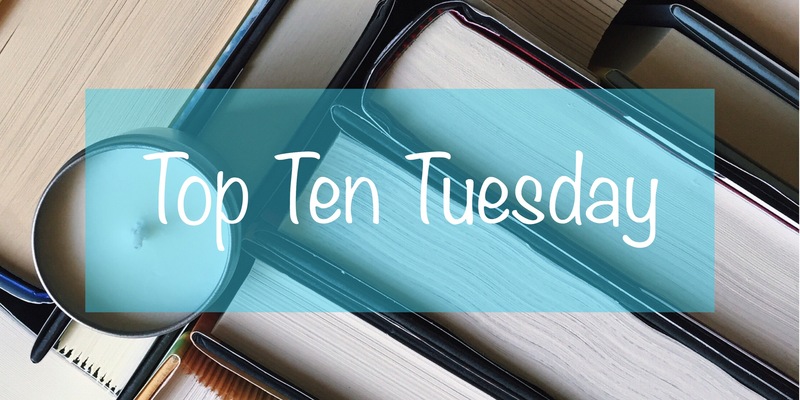 Today’s Top Ten Tuesday is about books I loved but will never reread again. I’ll definitely keep recommending them to readers, but I won’t be reading them myself. While I may reread the other books in this series, the first one is really painful to get through. I never would have continued this series if I hadn’t been encouraged to. If you’re on the fence about this series, I recommend giving yourself until the end of the second book before deciding if you’ll continue or not. This was such a creepy book but I devoured it. It’s about a woman who kills her husband and then asks her coworkers to help hide his body. It’s female centric too! I knew this one was going to be violent and grotesque, but I was still not prepared. I really enjoyed it but it’s so long! Talk about an awesome cover page. Ava’s Demon is an incredibly beautiful series that exists online for free, for which I am extremely grateful. The artwork is stunning and the story is engaging, and I heartily recommend this for readers who like graphic novels and readers who like dystopian, fantasy, and science fiction stories. You can find the ongoing series here. The author seems to be halfway through (my rough estimate) chapter nineteen. It’s updated regularly on Thursdays AND –my favorite piece of information–it’s FINISHED. The only thing the author-illustrator needs to do is draw it! I find that so incredible. Ava’s Demon starts out simply enough. Ava, one of the main characters of this story, has a demon that has been with her for her whole life. The demon has been whispering horrible things in Ava’s ear since she was a child, so Ava is not a happy person. Not at all. She goes through her days feeling unloved and forgotten, but wishing that she wasn’t. When an attack hits her school and Ava manages to escape, the demon isn’t very happy. But when they crash land on a planet and Ava is injured in the crash, it seems the demon is finally going to get her wish. At the eleventh hour, the demon reveals that Ava doesn’t have to die and can start her life over–if she enters into a pact with the demon. Of course, demons tend to lie. Ava does survive, but not in the way that she was led to believe. Ava’s Demon then progresses into a story that blends fantasy elements with that of a science fiction world. It becomes about so much more than demons and their humans. As the story is ongoing, it’s a little difficult to review the plot since it’s just a small snapshot of the larger story. It definitely has dystopian elements to it where things aren’t always what they seem and there’s a organization–or a person (yet to be determined)–who controls a lot of planets. So far there’s only been a couple of places in the comic, but it seems like interplanetary travel may be used to show different elements of the world that Czajkowski has created. There’s hints about another force that destroys planets that hasn’t been fully revealed, as well as characters with pasts. 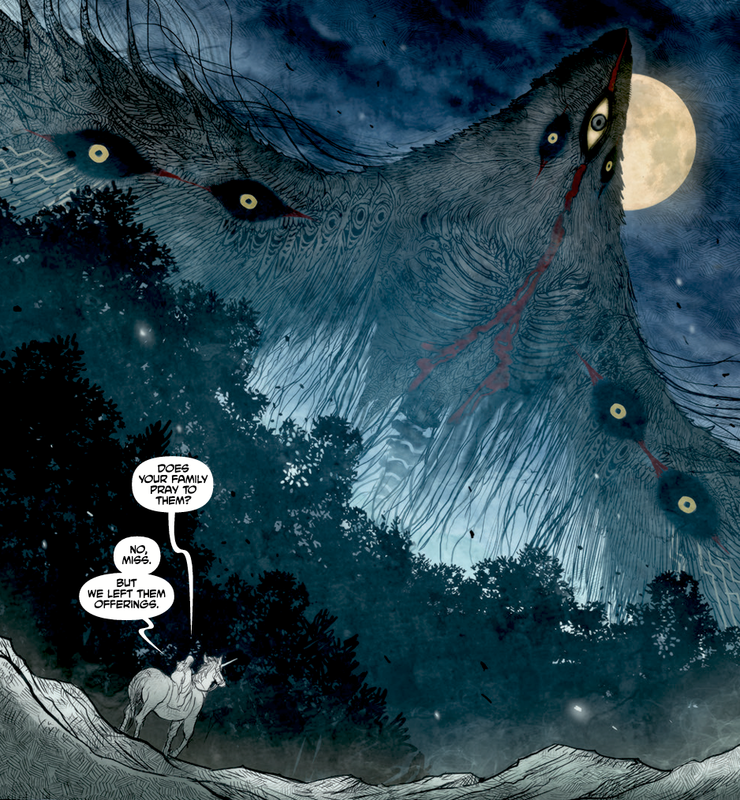 Ultimately, everything Czajkowski is doing is making me extremely interested in the story. It’s being given to the reader slowly, but gives us tantalizing tastes of the larger picture. I’m so excited to keep reading it. I chose a few panels that I thought illustrated moments of the plot but weren’t particularly spoilery of the larger story. All credit goes to the artist, Michelle Czajkowski, and panels are linked to their respective pages on the Ava’s Demon site. A person who takes over the world and has an organization full of followers. Slight spoilers for the previous four books are below. 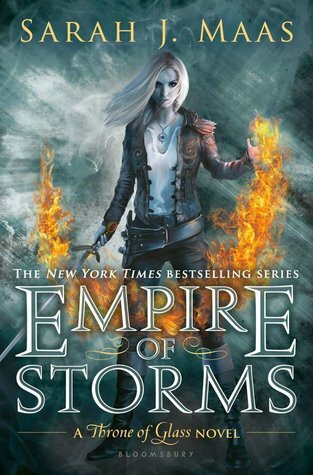 Empire of Storms finally brings together everything that began in Heir of Fire and Queen of Shadows. This penultimate novel in the Throne of Glass series showcases Aelin’s power–political, physical, and magical–in a way that really presents her as a Queen for the people. However, not everyone is as in love with Aelin and her fire as her Court is. Many fear what her power could mean for them, should she decide that she doesn’t like what they’re doing. As always, people who have power fear to lose it. Aelin has to prove that she won’t use her power to force people’s hands like she did in Wendlyn. She has to prove that she’s a Queen. I really enjoyed reading this book. Some of the events were a little more boring than others, but ultimately every moment, no matter how seemingly insignificant, matter. There’s a lot of perspectives in this novel and they’re all intertwined in a cohesive, entertaining, and emotional way. The book focuses on dealing with the aftermath of what happened in Rifthold when Dorian and Aelin end the King of Adarlan’s reign and the seal on magic. In the previous novels, characters had been introduced but we didn’t get a lot of time with them because of the focus on Aelin’s quest. This time, more of the pages were given to those side characters, and I think it worked really well. I enjoyed reading how characters functioned and acted when the group separated and Aelin was off doing something else. Rowan and Dorian, Lysandra, Elide, Manon, Aedion…and even characters that we’d previously been told were not necessarily allies got pages. While I liked them in the previous novels, Empire of Storms made me fall in love with them completely. 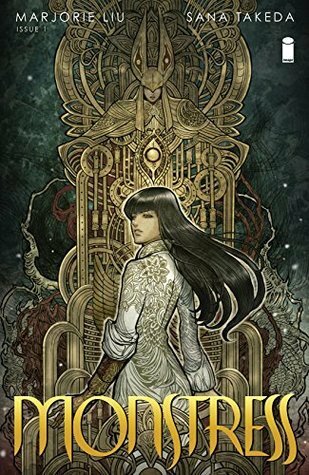 Monstress was a beautiful and deadly introduction to the world that Marjorie M. Liu created and Sana Takeda illustrated. After an apocalyptic event, lines were drawn between the Humans and the Arcanics. We follow Maika Halfwolf and her companions as they try to find what exactly happened on that day and how Maika is connected to it. Maika has secrets of her own and sometimes it’s best that they remain hidden. For the most part, I couldn’t get enough of Monstress. There were moments when the story was a bit slow because the author needed to introduce concepts or characters to the reader, but as a whole, it started immediately in the action and didn’t stop. We learn that there are the Arcanics, who look different from the humans (often appearing half animal) and who are not considered human ever since the events of the war. Treating them badly is commonplace, although not every human is like that. The Cumaea, a sort of witch-nun, are after Arcanics for their Lilium, a substance that they can harvest from Arcanics they’ve captured. They’re powerful enough that they can do what they want, and no one can stop them. This is a world that had steam-punk influences, but also maintained that it was a fantasy world where gods exist. One of my absolute favorite parts of Monstress was the fact that nearly all of the characters–the protagonist, one of the companions, the villains–were female. There were men, but the story was not driven by them. I love that the protagonist, Maika, was harsh and didn’t want to step into the shoes of a heroine when others pressured her toward that direction. She remained firmly rooted in her own motivations. She wasn’t unwilling to change, however. One of my favorite things to read were her actions with Kippa and Ren, because it really showed how traveling with them was changing her from this tough, prickly person to someone who was still tough and prickly, but she was willing to extend her drive to survive to protecting them. Maika is an unlikely caretaker, but nothing is more natural than her slipping into that role for Kippa. The characters in this are also extremely diverse. Because there was an apocalyptic event in this world, it seems like everyone who survived came together and built what they could. There’s not any room for prejudices, unless you’re an Arcanic. 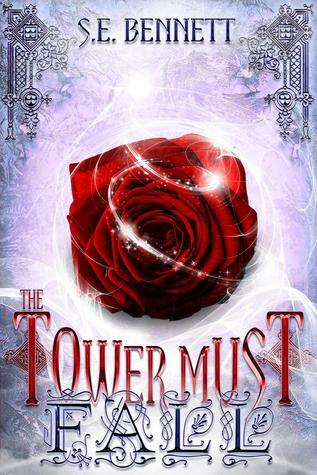 The Tower Must Fall is the story of what happens when fairy tales end. When humans are the majority and those who are Cryptid–the witches, faeries, the creatures of myth–live in fear. Marek Tobar dreams of the day when humans and Cryptid can live in harmony and no longer fear death at the hands of the Animus, a group of people who believe that Cryptids are the scourge of the earth. Tension has been growing for centuries, and Marek finds that he may be more important to the war than he originally thought. Along with Enyo, a reformed Animus, Marek must try to create a place in the world where coexistence is possible–but it may come at a cost too great to bear. I wanted to like this book. The premise pulled me in and initial reviews praised it highly. And I did enjoy the first part of it. The writing and dialogue was intelligent and interesting, and I wanted to continue reading about this world. It seemed really unique. But at some point, that all dropped off. I needed to push myself through sections of text more and more. It dragged. Many times I questioned if I wanted to continue this book. I’m glad I did, because I enjoyed the ending. At the same time, however, I’m not sure it was worth struggling through the huge middle section when I only truly enjoyed the first part and the end of the novel. I think the cause of this was the plotting. It was very odd. It was almost like reading a book that had half of its pages torn out, because it jumps from moment to moment and doesn’t give us all the information for something that has just happened. In one chapter, we’re in one place and in the next it seems like months have passed. Of course, there were things that really worked for this novel. As mentioned before, the writing style was really clever. I enjoyed S.E. Bennett’s descriptions of places and characters. The author took traditional fairy tales and twisted them. In this world, fairy tales as we know them are stories that are not remembered correctly. I liked that the author took the idea that history is told by the victors and made it work for fairy tales. Those that have been cast as the villains in the story are not happy about their roles. While humans view them as monsters, they view themselves as people. Sure, there have always been quarrels between different Cryptid tribes, but they only want the things that humans want: freedom and the ability to live in peace. Instead, they’ve been cast as second-class citizens, sometimes even being hunted down. They’re not recognized as anything but monsters, and some have decided to make that true. Others still hope for a future, and thus the rebellion was born. The opening of each chapter deals with how the sparks of this rebellion have resonated and continued to the present day of the novel. The stories were steadily shown to be all connected. The Queen of the Tearling was one of my favorite novels that I read in 2015. This series is set in a feudal fantasy world with a main protagonist who makes mistakes as she comes into her own power. Kelsea Raleigh has been in hiding for most of her life. When she comes of age, Kelsea has to return to a kingdom that she has been so removed from that she doesn’t know if its people will even love her. She has to pick up the fractured pieces of the kingdom and its people all while dealing with the repercussions of actions she hardly understands. It is a tale of adventure and political intrigue, which can sometimes fall under the boring spectrum for me. 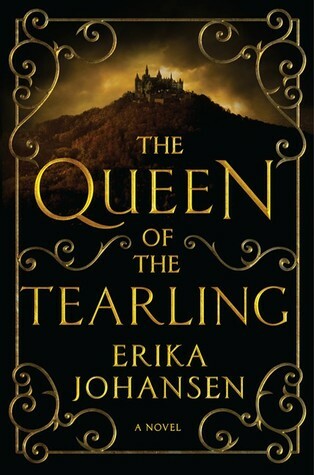 Although it had a bit of a slow start, The Queen of the Tearling became a book that I couldn’t put down. What works for Queen of the Tearling was surprising. Political intrigue isn’t always something that works for me as a reader; it sometimes can go too in depth without actually expressing the direness of the situation or becomes too dry with names and places à la Game of Thrones (at times). So although there were a lot of situations that dealt with politics her mother or uncle had set up, it was interesting to read how Kelsea dealt with them. She also made a lot of mistakes politically that had consequences that she had to deal with. They weren’t glossed over because they were used to show how she grew and reacted as a ruler. Alice in No-Man’s-Land is the story of a privileged girl who only thought of the Blocs, huge areas of towns that have fallen into disarray after a food based disease ravaged them, as a cheap form of entertainment. After all, they’re only there temporarily until Cerulean Holdings goes in and fixes them. Up until she is stranded in one of them with only two of its citizens to help her. Alice’s journey through the decaying bloc is full of brushes with danger and moments of clarity. If she manages to get out of Ypsilanti Bloc, she won’t be leaving as the same person she was when she entered. 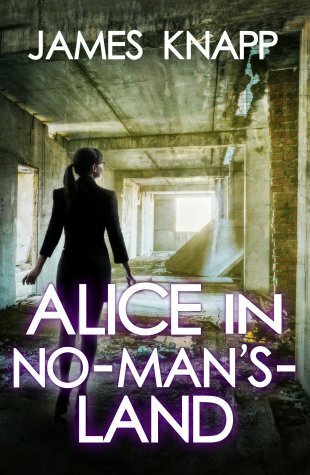 While the idea at the core of Alice in No-Man’s-Land was something that I could have gotten behind, the novel read too much like a formula. There’s a girl who has no idea that there’s something very much wrong with her world. When she is suddenly thrust into the very essence of what is wrong with her world, she begins to realize that things have to change and she is apparently in charge of doing this. I think that’s why Alice read as boring to me. She’s the typical hero of a dystopian novel, but she didn’t have anything that really made her stand out. I didn’t feel like she was a very relatable character, even though she did have some character development later on.